It's really difficult for me to write this blog post. I never thought I would be writing about quitting breastfeeding, especially with my daughter being just over a week old, and especially since I breastfed my son for 14 months. Breastfeeding Isabel started out really well. She knew exactly what she was doing right out of the womb. She latched right on and had a great sucking reflex. I, however, struggled with the pain of breastfeeding. I was really hoping it would be less painful this time around, but it really wasn't. I know some pain is normal at the beginning of the breastfeeding relationship but I was already having flashbacks of everything I went through with Liam. I wanted to stick it out with Isabel and went to see a lactation consultant. I thought things would improve but it was still taking quite a bit of work and one night I nearly had an anxiety attack trying to get Isabel to latch properly. Alex witnessed it and I think it scared him a little bit. Breastfeeding is so important. There's no comparison between breast milk and formula. I was so proud when I was able to successfully breastfeed Liam for 14 months. I was prepared to do it all over again with Isabel...but not at the expense of my own mental health. The anxiety was too much for me. I don't want to cringe every time it's time to feed my daughter. I don't want Liam and Isabel to see me so upset all the time. I just want to enjoy being a mom. Will I regret this decision? Maybe. I don't think so. I will always feel a little pang of "if only..." but I know this is the best decision for our family right now. I have felt much relief since deciding to switch to formula. My body has been through a lot. I didn't get a break between pregnancy and breastfeeding and pregnancy and breastfeeding. I feel like Liam just weaned (really it's only been a little over four months) and I was enjoying the freedom of not breastfeeding anymore. I will continue to pump my milk until I dry up so she can have the benefits of breast milk even if it's not straight from "the tap." I say some breast milk is better than no breast milk. So it is what it is. 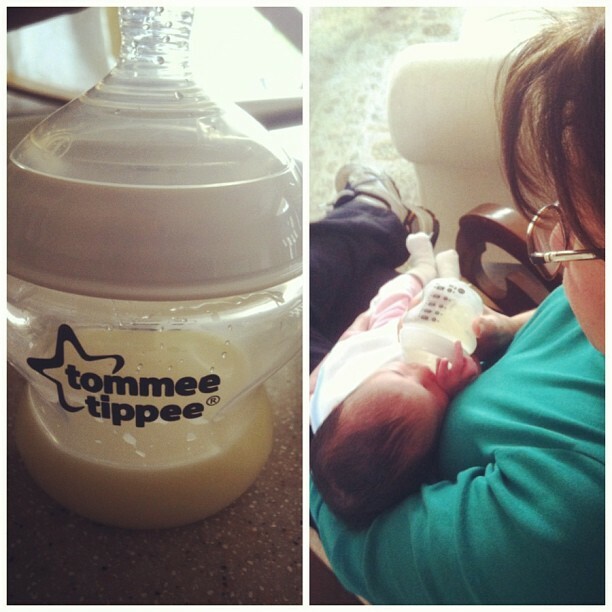 I'm thankful that I have an alternative to turn to other than breastfeeding. And I'm very thankful for a supportive and loving family. I pray that little Isabel will continue to grow and thrive whether she's drinking breast milk or formula, and I'm sure that she will. *Here's an article that resonated with me about breastfeeding and maternal mental health. *And this blog post from Kelsey on Words of Williams was very encouraging for me as well. *Please no rude comments. As I said above this was a difficult decision for me to make and I didn't make it lightly. I feel like I'm letting a lot of people down, but my story is not your story and I still encourage and promote breastfeeding 100%. Nursing my precious baby girl.